This adventure clocks in at 24 pages, 1 page front cover, 1 page editorial, 1 page SRD, leaving us with 21 pages of content, so let’s take a look! If the appropriation of Paizo’s slogan for Goblin-PC adventures was no clear indicator – this module is set apart by one very crucial factor: The PCs are all dragons! While it is possible to use appropriate regular dragons, the module’s base premise works imho best if you use the plentiful pregens included. 9 of these are provided, all clocking in at CR 4 and representing, as a whole, a pretty diverse spectrum. The dragons range from arcane dragon to blood dragon, caustic dragon, corruptor dragon, harmonic dragon, radiant dragon – basically, these dragons get supplemental abilities that help them fill in adventuring roles: The blood dragon, for example, gets a rage, while the radiant dragon’s breath weapon heals the living and damages undead – you get the idea. Beyond that, the pdf provides something I very much applaud – namely a cheat-sheet for Flight: Common uses and DC, etc. – it’s handy to have and makes for a nice hand-out when playing this module with players who are not as experienced with the intricacies of flight. The module does offer minor scaling variations, which can prove to be helpful. Now, the aforementioned dragons are undoubtedly dragons you never heard of before – there’s a reason for that – they may be the last of their kind…but to go into more details, I have to start going into SPOILERS. Potential players should jump to the conclusion. All right, only GMs around? Great! Balthazar Barrick was but a child when dragons annihilated all he had ever known. He founded the order of the wyrm and eradicated no less than 9 draconic bloodlines. Alas, his squire Elbin disagreed with his master’s trauma-fueled fanaticism. He saved a single egg from each bloodline, spirited them away and raised them for 15 years, far away from civilization, in a cabin affectionately called Scalehearth. Alas, recent expansions of trading routes have brought civilization perilously close…and Balthazar is still looking for his former squire, seeking to fulfill his extermination of the dragon PC’s bloodlines. Elbin, in the meanwhile, plans to move deeper into the wilderness…but as the dragons arrive from a hunting trip back at the cabin, they find it burning, Elbin wounded with a nasty gut wound and a nasty and utterly obvious poison – thus, we begin with a tripartite skill-challenge type of encounter that is surprisingly fun to run – three tasks, all time-sensitive – cool way to kick this off! We get different read-aloud texts and slightly different information, depending on whether Elbin lives, obviously – turns out that a scout of the Torn Company, a poacher group, have been hired to track Elbin and his draconic brood – the trail leads towards the wayside inn that was rather recently constructed – the Toasted Toad, where some interrogation by overt or covert means (bloodshed and violence optional) predates the arrival of the Torn Company…whether the dragons engage or flee is up to them. Editing and formatting are very good, I noticed no serious hiccups. Layout adheres to a printer-friendly two-column b/w-standard with red headers. Interior artwork is solid b/w-stock. The pdf has no bookmarks, which represents a minor comfort detriment. Cartography is in full-color, but extremely rudimentary – it’s just a collection of color-coded squares. Even a pencil-drawing would probably have been nicer. 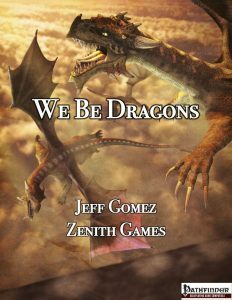 Jeff Gomez’ “We be dragons” is a fun one-shot – particularly suitable for convention-style gameplay or as a change of pace, it represents a fun diversion from the standard adventuring tropes and trying to reinvigorate one’s bloodline can make for a great, epic campaign goal that is pretty inspiring. The challenges are diverse enough and, in fact, very much fun. That being said, the lack of bookmarks and the pretty bad map represent some minor blemishes for the module. It should be noted, though, that at the extremely fair and low price-point, this is definitely worth checking out. My final verdict will clock in at 4 stars. You can get this inexpensive, uncommon module here on OBS!